Oh, how I miss those wonderful days before June 23 2016, when Northern Ireland was a land at peace with itself and all the parties worked together in common cause towards a single goal. Old enmities had been set aside; new voices and vehicles had been established; and our Assembly and Executive were models of cooperative efficiency and the envy of the democratic world. We worked together in harmony. The ‘Irish question’ had been addressed and resolved. Do you miss those days? Of course you don’t. They never existed. Yet, to listen to some people – far too many people in fact, most of whom should know better – Brexit is to blame for all our present woes. A leading businessman told me the other day, “If we got Brexit sorted and the backstop in place then it gives us the chance to deal with all the other problems”. The small group listening to the conversation nodded their head in approval. When I pointed out that the 18 years prior to the EU referendum – for most of which this businessman and the group around him had constantly bemoaned the state of politics here – had failed to change much, he had nothing to say. When I hear people rattling on about the sudden risks to the Good Friday Agreement I’m also puzzled. I don’t remember them expressing those concerns for the agreement when the St Andrews deal between the DUP and SF – particularly the changes made to the rules governing the appointment of the first minister and the perma-frosting protection for the petition of concern – effectively closed the doors to genuine cooperation and cemented us-and-them as the only way forward. Both the UK and Irish governments endorsed these changes. If, as was stated in 1998, the purpose of the GFA was to push us closer together, then both governments undermined it, deliberately so, when they went out of their way to shaft the UUP and SDLP and focused all their efforts into getting the DUP and SF around the same table. Even though, as was clear from the outset, their relationship was always going to be built on a mutually self-serving fraud. The GFA had a number of purposes: to create an environment in which terrorism would have no support; create the political circumstances in which new political/electoral voices and vehicles would emerge; pave the way to increasing social/civic integration; allow former political enemies to agree and implement a Programme for Government which would benefit everyone in Northern Ireland; allow people to protect and preserve their own sense of identity; and begin a new era of cooperation and mutual understanding. Most of that hasn’t, in fact, happened. My own view – and I was writing about this long before Brexit – is that NI is more polarised now than it was in 1998. Of the 90 MLAs only three (the two Greens and one People Before Profit) could be described as ‘new’ and represent just 4% of the total vote. The DUP/SF/UUP/SDLP account for 81% of the votes cast. Alliance is still in single figures. I keep being told – mostly on my Twitter feed – that surveys and polls suggest that somewhere between 17% and 20% of people in NI don’t define themselves by the constitutional question: but until they make a significant electoral breakthrough then, to be brutally honest, what they think doesn’t actually amount to a hill of beans. I could go on, but my primary point is this: the GFA which was endorsed by 71% in 1998 exists almost in name only today. Whatever hopes were raised back then have been dashed and crushed. And while the British and Irish governments are happy to talk up the fact that the GFA exists, they also opted to be mute and motionless as the key purposes of the agreement were wilfully swept aside by key players. 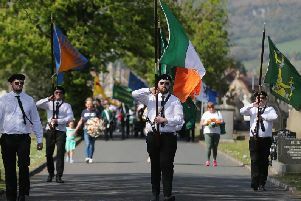 I’ve mentioned before that I sense that all of nationalism in NI has moved beyond the Assembly and an internal settlement; while SF is insisting on a border poll which, they hope, would deliver a result which would kill off the agreement (which, let’s not forget, they always regarded as a mere transition to Irish unity). I don’t buy into the notion that the Brexit result ‘poisoned’ civic/political relations in NI. That particular ship had already been sailing for well over a decade. Pick your side and blame whom you wish, but the reality is the same: the vast majority of those who vote in NI have no particular interest in working, sharing or governing together. That was true before June 2016 and it remains true now. It’s a rarely stated irony, yet an irony nonetheless, that the 1998 referendum overwhelmingly endorsed an agreement that has, at many levels, singularly failed to deliver a darn thing it was expected to deliver. So why the obsession with protecting it right now? What, exactly, is being protected? Are the political/social/civic structures across NI so fragile that total breakdown is likely – some almost seem to be arguing it would be inevitable – in the event of a bad deal or no-deal Brexit? And if it is true that the structures really are as fragile as some suggest, in what way would a backstop actually repair and strengthen the structures? I have no difficulty with the issue of the GFA being raised in this debate: that said, the debate should embrace discussion about the ongoing failings and future purpose of the GFA and set out measures by which the very obvious problems can be addressed. I grew up close to the border and crossed it many times in my childhood – my family had roots and friends in Sligo and I had many happy summer/Christmas holidays there, as well as in Donegal, Galway and Cork. I don’t hate the Irish and have never experienced any hatred from them. But I remember the Army/police on the border and I don’t want to see that again. The present problem can be solved. But it requires some basic honesty from all sides – particularly about the Good Friday Agreement.